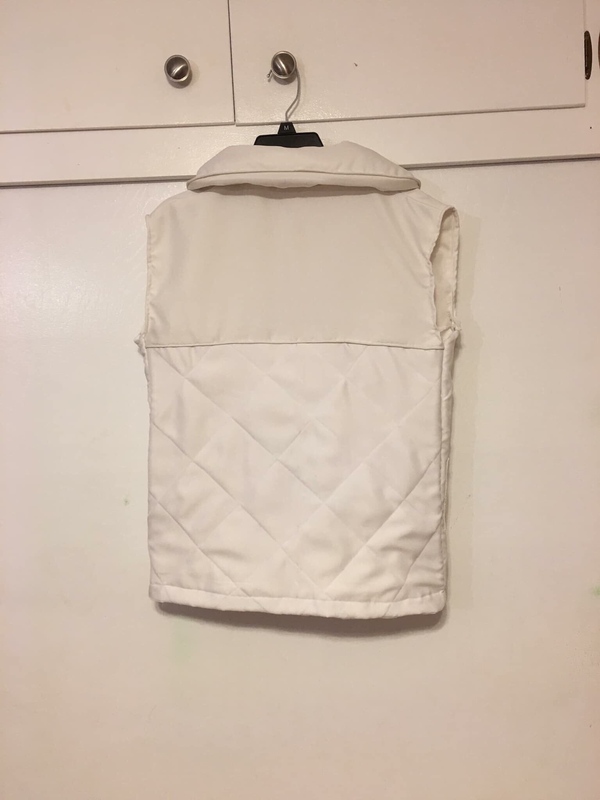 I have been asked by a few people about how I made my vest for both Hoth and the Harbringer versions so I thought I would put together this quick tutorial for how I made mine and hopefully it helps people out. 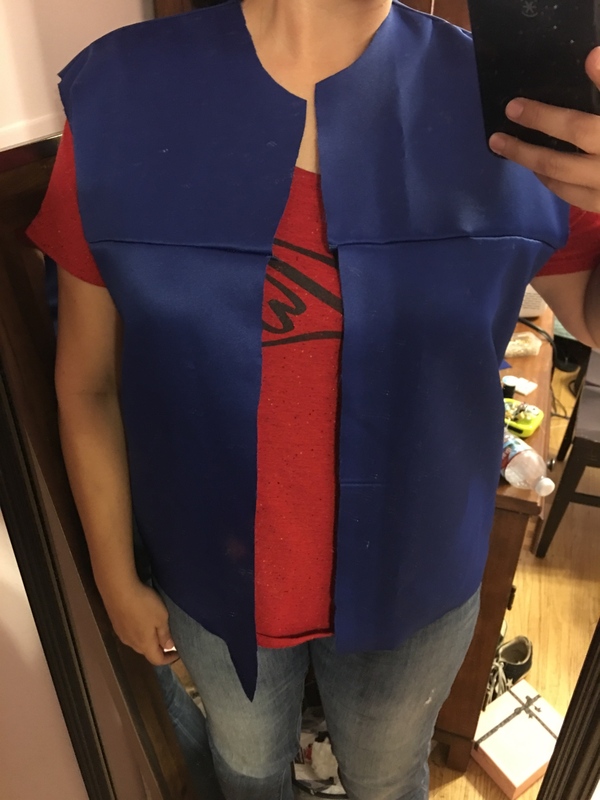 I used the Green Pepper Polar Vest pattern for my Hoth and I also used it (with some minor modifications) for my blue vest as well. 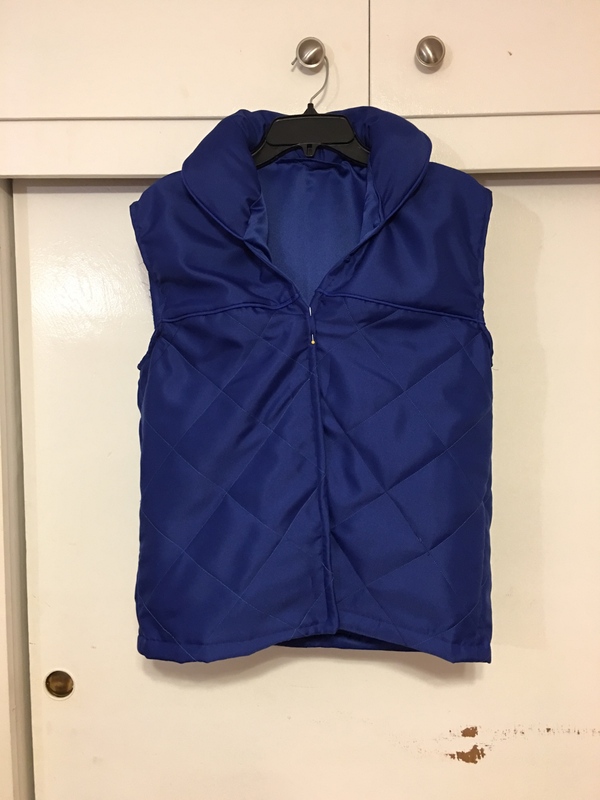 If you cannot find the Green Pepper pattern, this is what I did to make an ERT vest, which is quite similar with regards to the yokes, and can be modified. 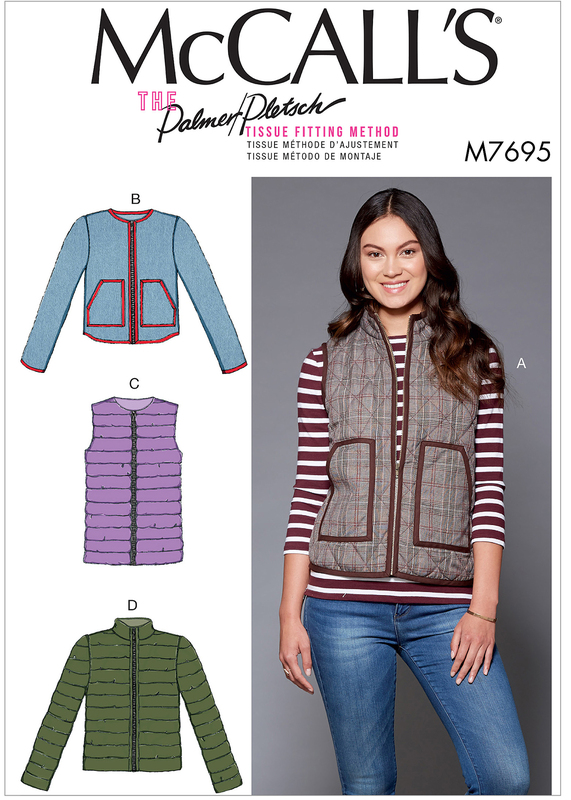 Find a plain vest pattern that works for your sizing. 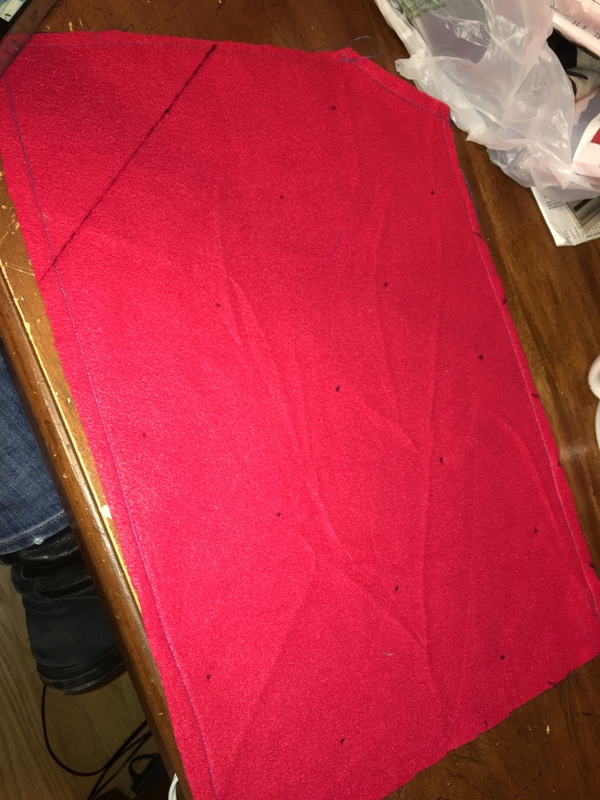 For my ERT, I used this McCall's pattern which worked great. I cut out the pattern to the size I needed and then made these modifications. The Green Pepper pattern already has the yokes but as this one didn't, I had to add them in. 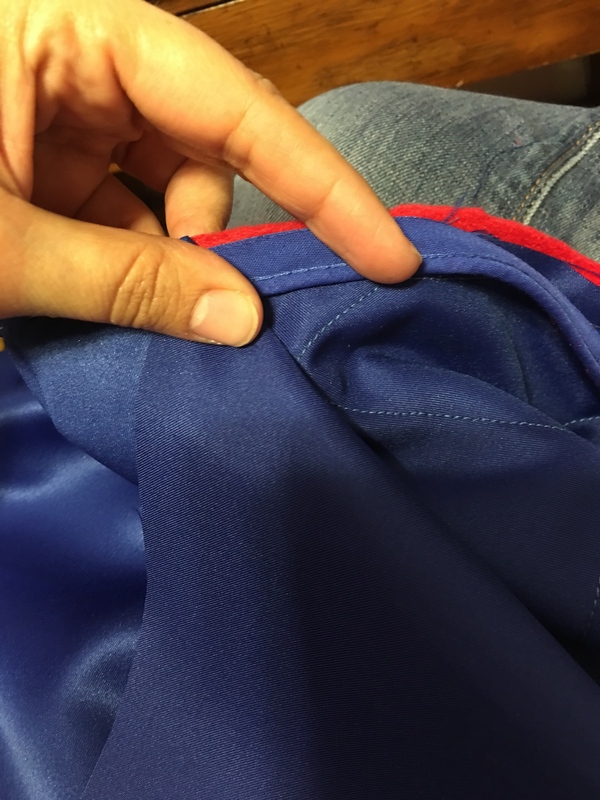 Make sure to allow for seam allowance when cutting your fabric. 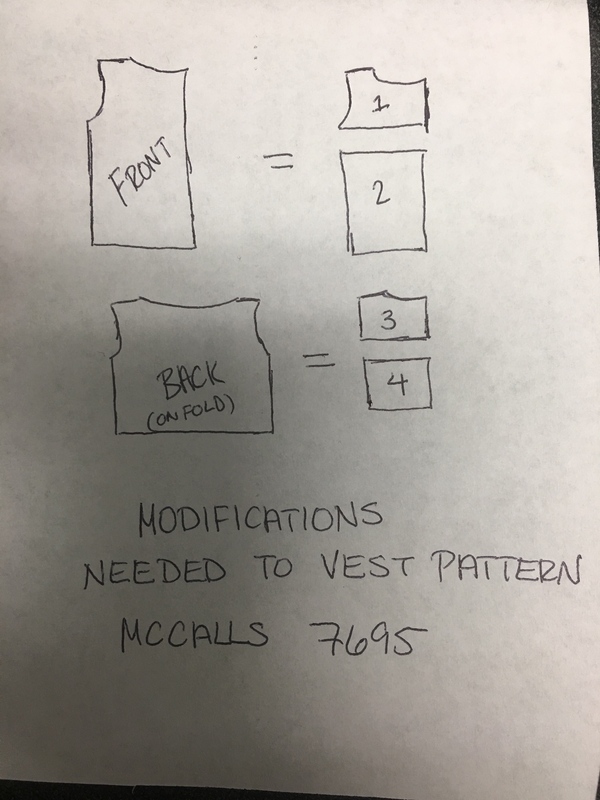 For the Hoth vest, you will need to make a collar pattern piece and a faux pocket pattern piece & an ID pocket pattern piece. For Harbringer, you will just need the collar. The additional pieces should look something like this. 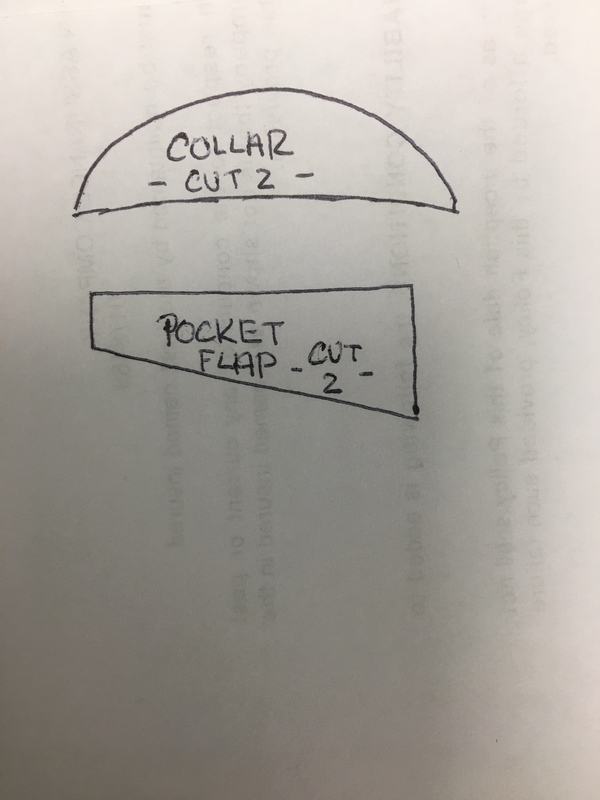 Not sure how best to draw an ID pocket pattern piece but it should be made to the size of your rank badge. I did not make mine until my 3D print was in my hands so that I could fit it accurately. I found this amazing tutorial on YouTube on how to make an ID pocket and I highly recommend it. Once I had all my pattern pieces together, I got started. The images are from my Harbringer vest making session but can be copied for the Hoth vest as well. 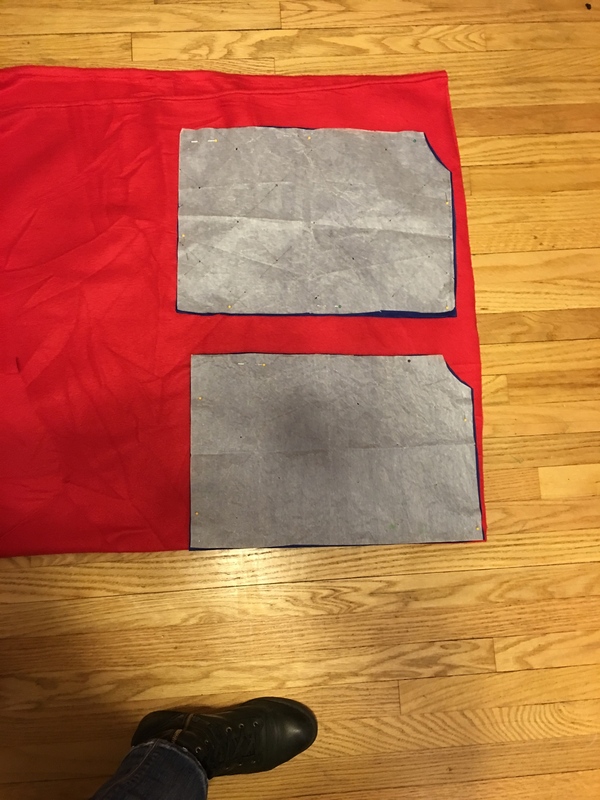 I cut out my pieces out of the regular fabric and then I also cut the padding fabric out of the same pieces. You just need to cut the pieces for the bottom sections for that. 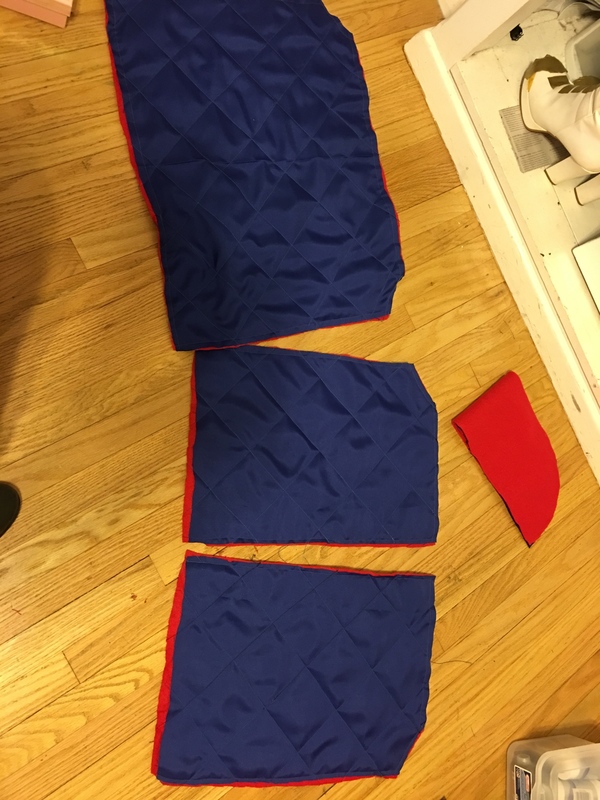 I was out of padding when I made this and the store was closed so I ended up using leftover fleece from a Santa cape and it actually worked really well! Here are my lining pieces cut out. 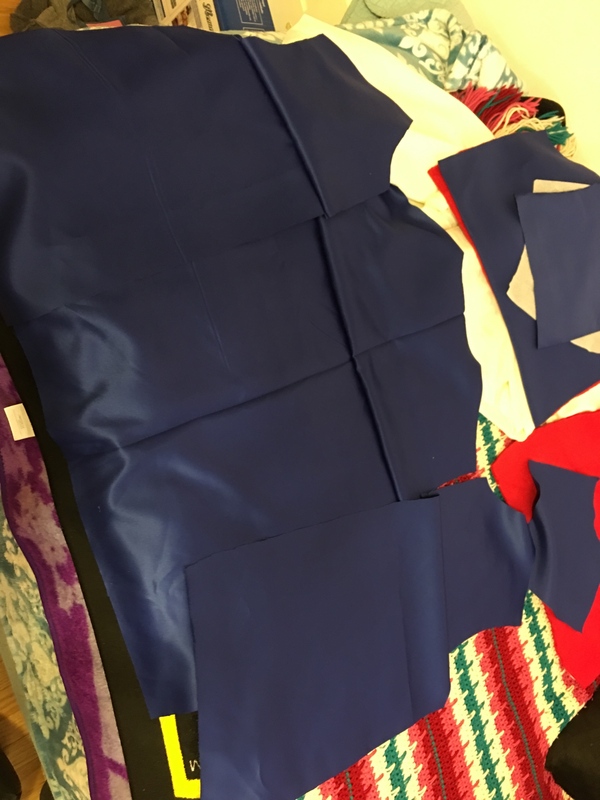 I always do a try on with my lining fabric just to make sure that everything fits right, especially if I didn't make a mockup beforehand. Luckily, this fit great. One thing I added to both of my vests were interior pockets. My base mate, Amanda, who also made Hoth Leia, suggested that I do this to mine and I cannot recommend it enough. 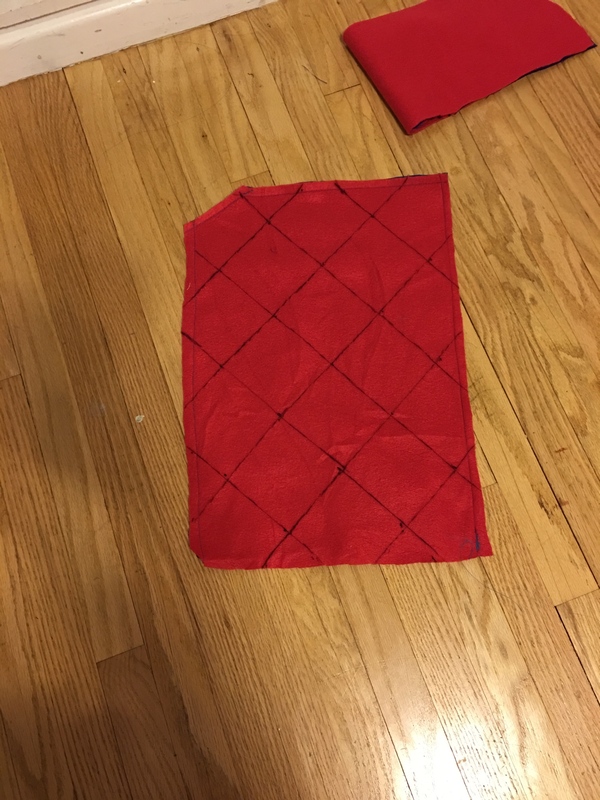 I cut out two rectangles that were long enough to fit my phone and added one to each side on the lining side. 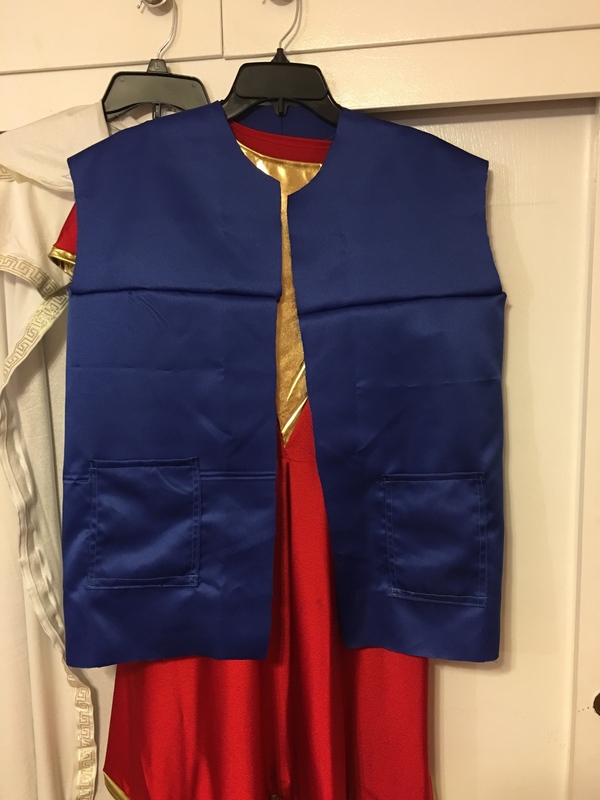 Once the lining is done, I then started the actual outer vest work. 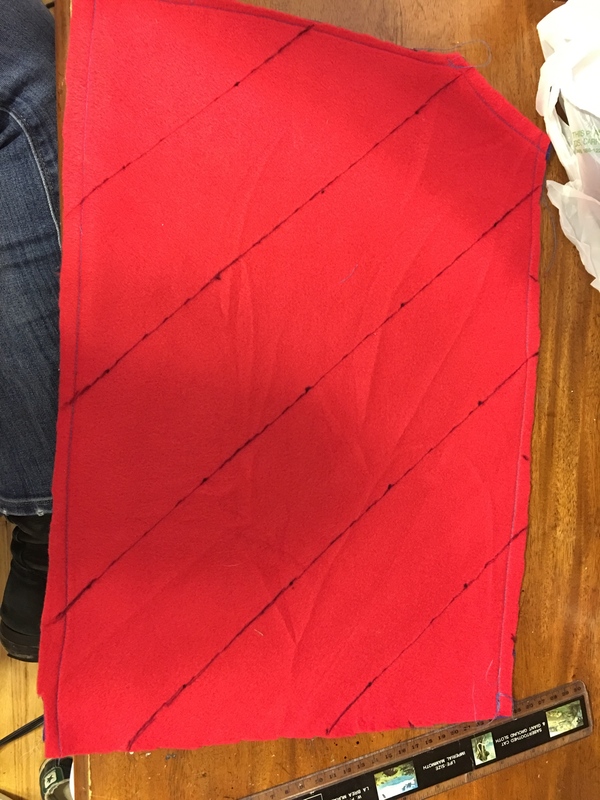 I stitched the actual material to the padding fabric (red) to hold it in place and used a basting stitch. I did not stitch all the way around but left the bottom portion open. Once that was done, I began marking where the lines for the diamonds would need to go. I made these marks on the inside of the padding and used a fabric pen and a ruler. First I marked with dots where the lines should go and then, using my ruler, I sketched them in on the diagonal first before connecting them on the other sides. Once all the lines were drawn in, I started top stitching all of them to create the diamond effect on the outside. Here are the finished pieces after being topstitched. 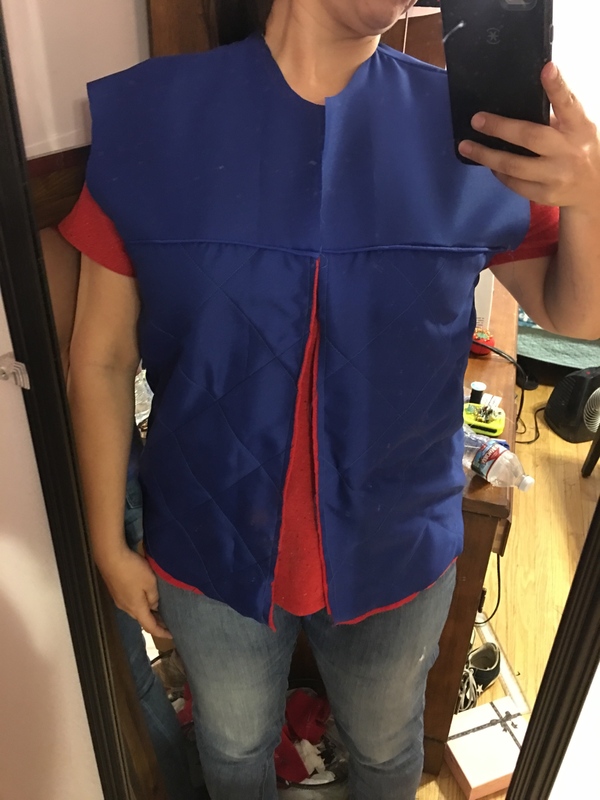 The majority of the work on this vest is the top stitching. Once that is done, the rest is fairly easy. The next step is inserting the piping. I placed the piping between the two cut pieces and pinned it in place. 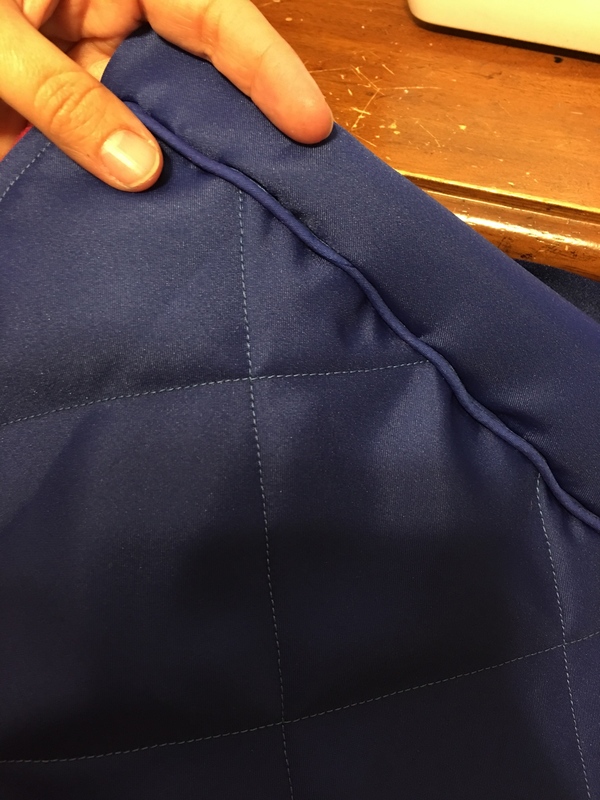 Once the piping is pinned, you then sew the seam like you normally would and flip it over. 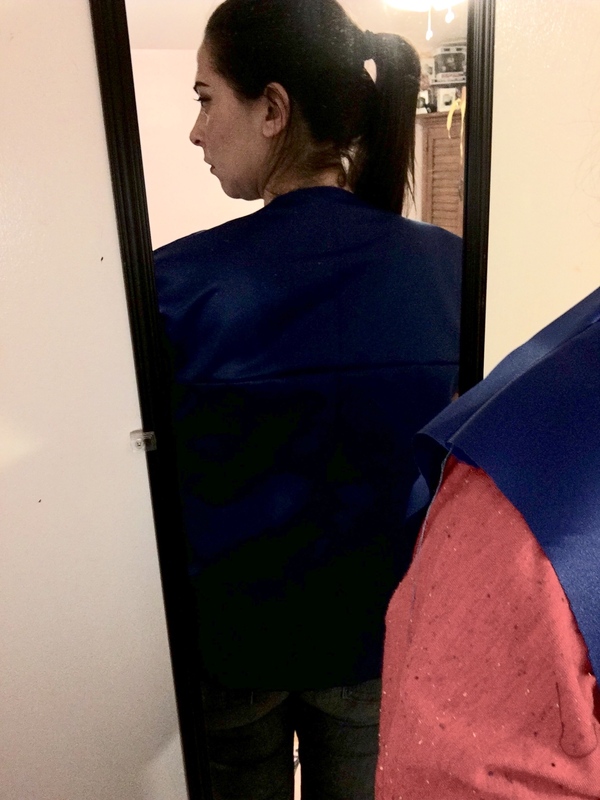 Sometimes you have to go over the stitch again to make sure the piping "catches" correctly but this was the finished back piece after it was put in. 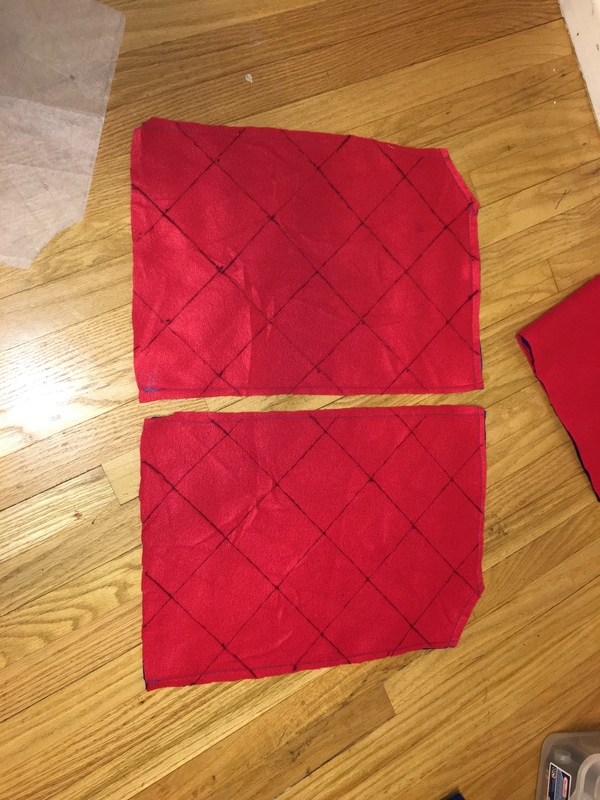 Before you sew the lining to the vest itself, you need to make and finish the collar. I cut the collar pieces, installed the piping around it just like I did for the yokes and then stuffed it with leftover Poly Fiber Fill. Please note that the Harbringer vest has a thicker collar than Hoth does which is why this is bigger. 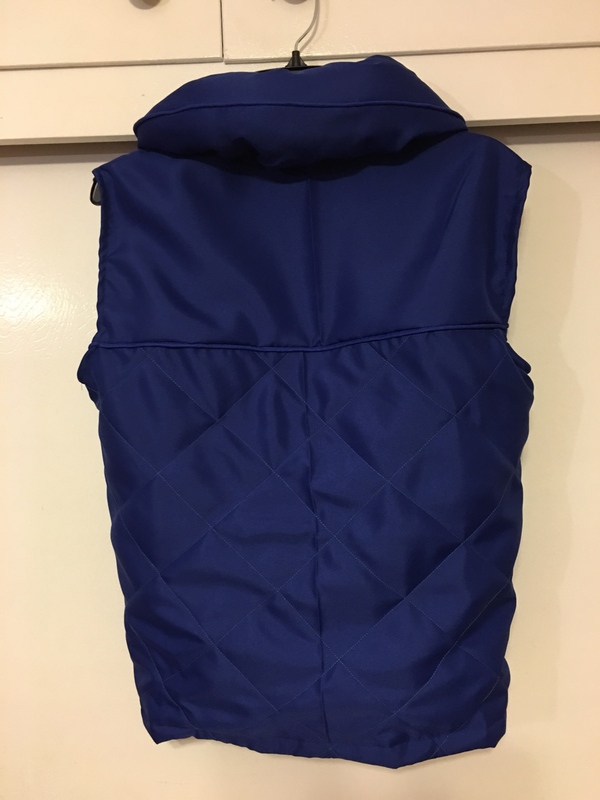 You can also use similar padding to what you use for the vest itself but I found the Fiber Fill worked better for me since I needed that bigger collar. 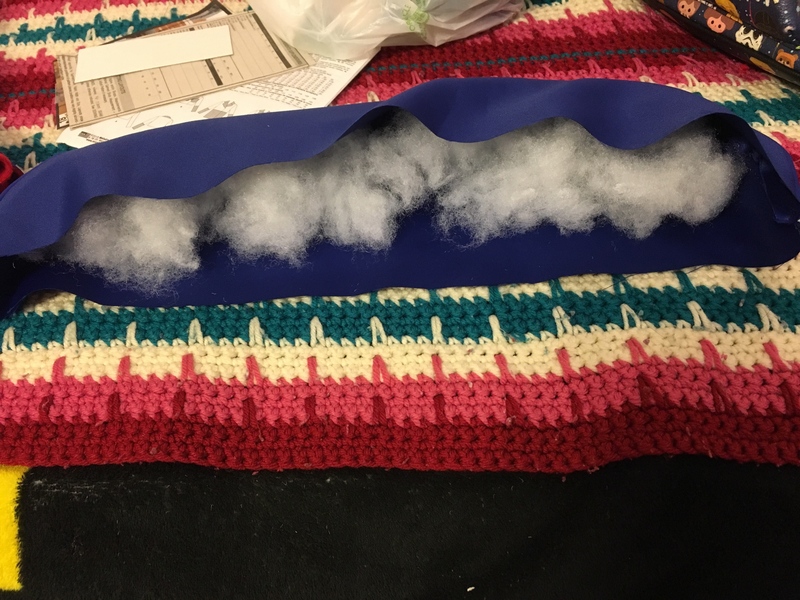 Once the collar is done, pin it between the lining and the outer part of the vest and stitch as normal. 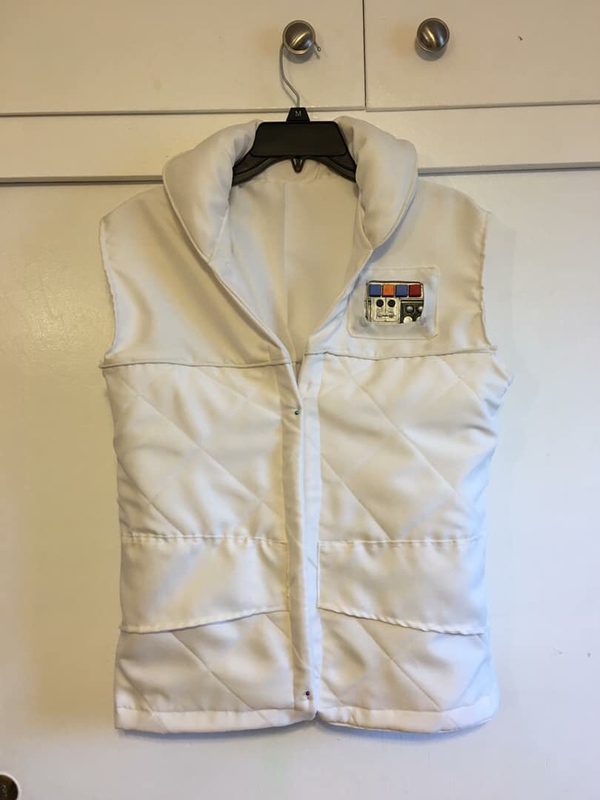 If you are making the Hoth vest, you would add the faux pocket flaps to the front before stitching the side pieces together and also add the ID pocket at that time. 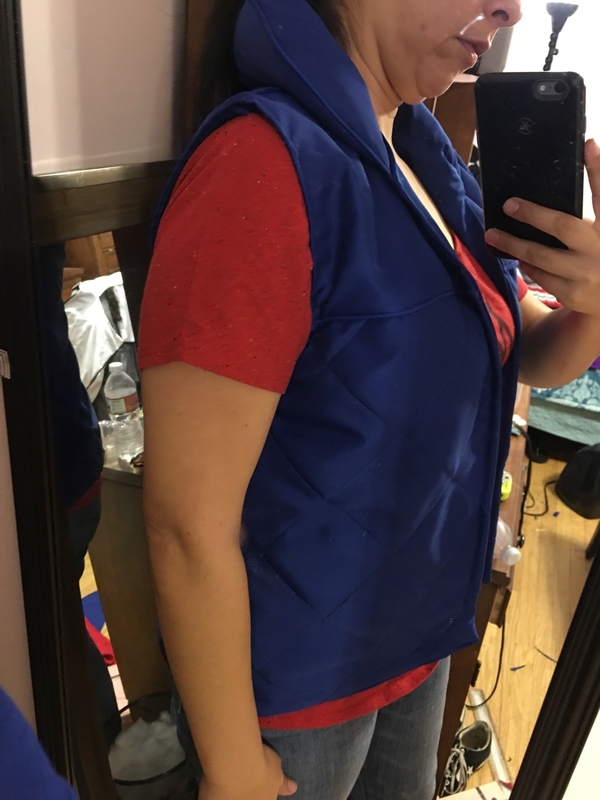 Here is my try on of the mostly finished vest. 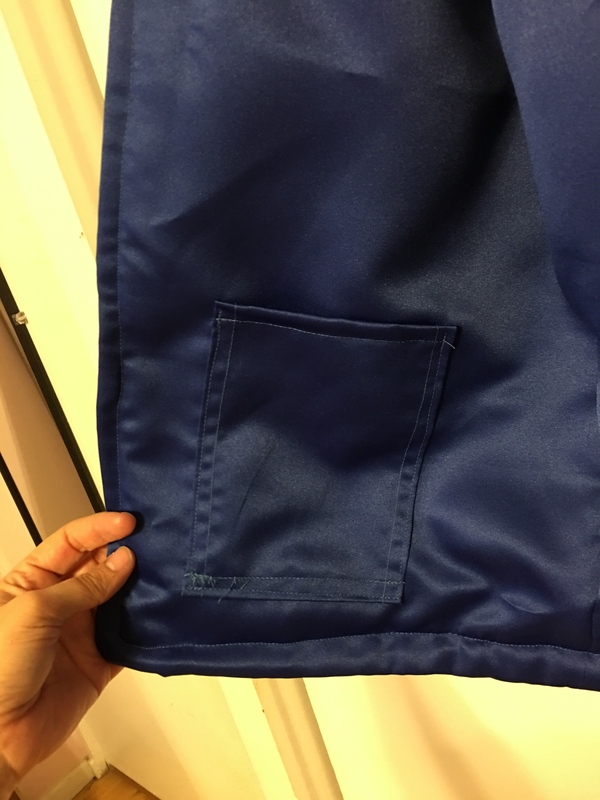 Here is a closeup view of the pockets I added. 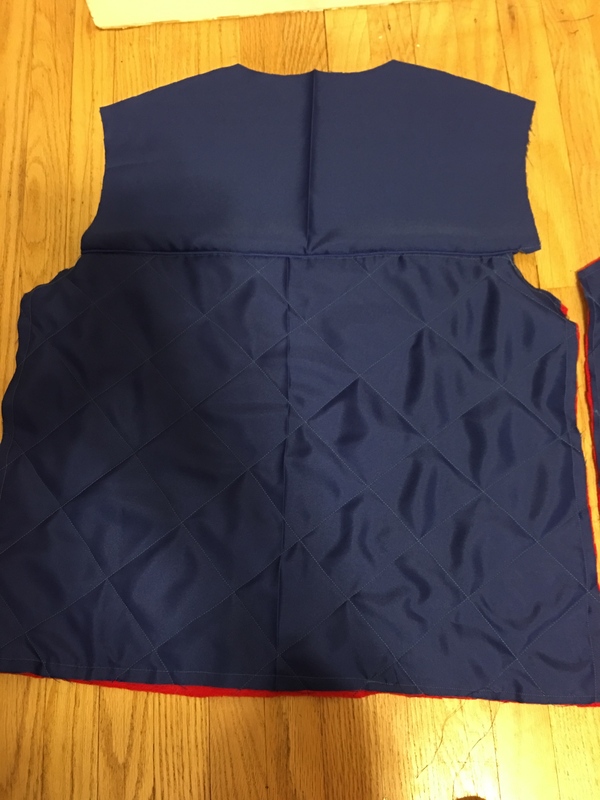 Both vests have a one inch line of top stitching all the way around from the collar, down and back up, so that has been added as well. Here is the finished Harbringer vest. Here is the finished Hoth vest. 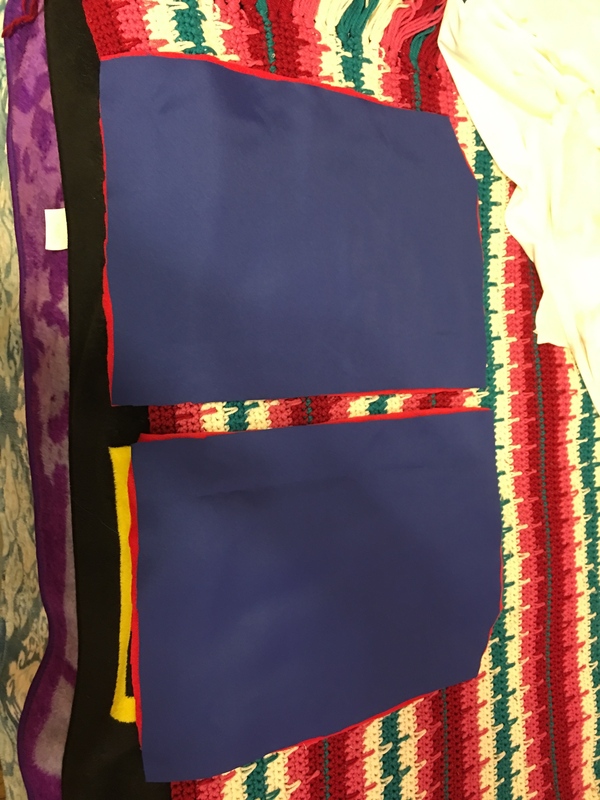 Both vests were made with the same type of material but in the different colors. I used a little less than 2 yards and that is including the self lining and the pockets. For the piping, I used Wright's piping in the corresponding colors. Once you get going, it doesn't take long at all. It is mostly the top stitching that takes the most time. Hopefully this helped anyone interested in making this costume. Thank you so much! I'm planning to make the Hoth vest sometime this year and this is extremely helpful! You are so welcome. 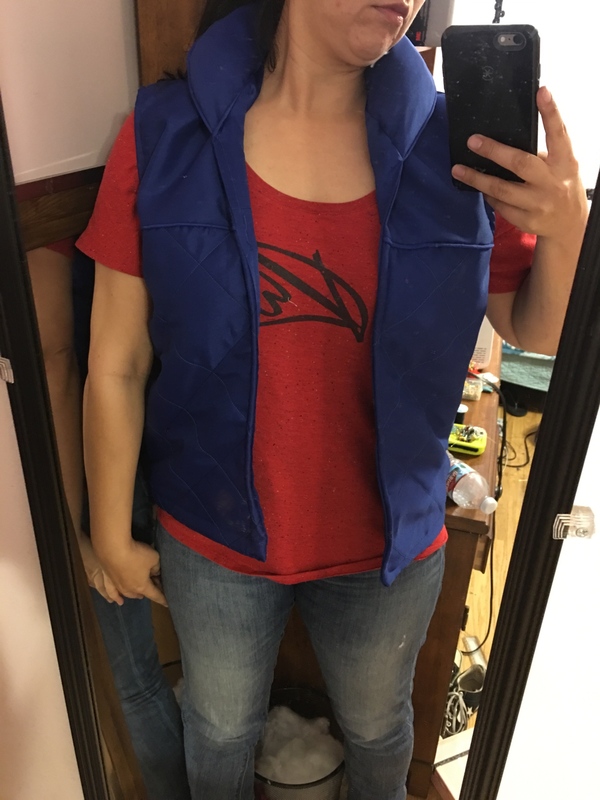 I was also intimidated by the vest at first but once you take it a piece at a time, it’s not so bad. Good luck on your build and please feel free to PM me if you have any questions. Tagging this post for later consultation. LOL Good! I have no doubt you can make this as your ERT vest came out phenomenal. As always, happy to assist if you have questions.